that they would never see her again. Boy, were they ever wrong! Last month, after Leonel passed away, the grown children decided to do a major clean out of the house. One of the areas most in need of a clear out was an upstairs storage room where Leonel kept all sorts of junk that he was planning on fixing up. His son Leandro was doing his part by hauling trash out to the curb. A neighbor noticed one of the bags and asked him if he was really planning on throwing out the turtle as well. It was a shock to the entire family that Manuela was still alive -- a miracle if they had ever heard of one. Somehow the tortoise had managed to survive on her own for 30 years lost in the storage room. Manuela had been given to Leandro's sister Lenita as a gift. In the wild tortoises are omnivores and will eat just about anything to survive. In addition they carry fat reserves for when food is scared. 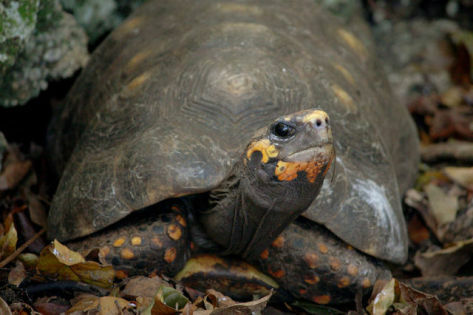 Red-footed tortoises are hardy creatures and can go for two or three years without eating. The Almeida family assumes that Manuela managed to survive by eating termites. However Manuela managed to stay alive, it is something of a miracle. World’s Largest Albino Wels Catfish Discovered In Spain!